"George, Bonnie, John, Kathy, Jodie and Edie went above and beyond to help and create the most beautiful fireplace. Jason did an amazing job on the mantel. John's installation and entire team are superstars! 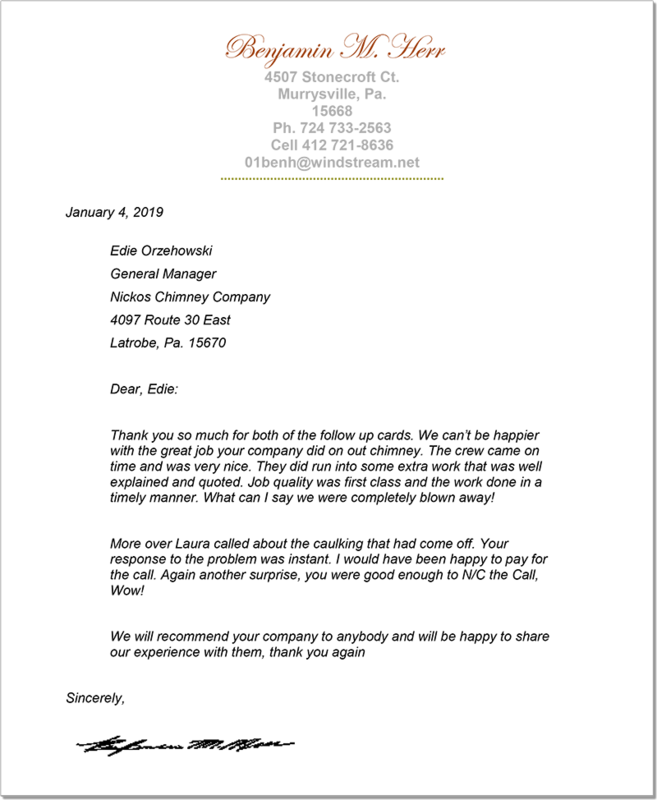 "Thank you Nickos for a professional job, plus the friendliness of your staff as they worked real hard to give us the fireplace that we wanted and will be able to enjoy for years to come." Very professional staff. They did exactly what they said they would do. I am in love with my new gas fireplace! Everyone was great! Friendly, professional & hard working. Installer Tom was awesome! He was professional & friendly, very pleasant to be around while he was working on the house. His work turned out Perfect. All of the employees whom we came in contact with at Nickos were extremely helpful with our installation of our insert. We were impressed because most employed in today’s stores are not nearly as good at their jobs! Everything you folks did from answering questions, scheduling, workmanship, install, lining up the rug contractor was far above my expectations. The stove looks awesome. Can’t wait to use it in November. Thanks. The guys were great and did a good job as usual!! Thanks!! We appreciate you for being there to clean our chimney and make necessary repairs, as we truly enjoy using the fireplace in the winter. Our visitors enjoy the heat as well. Plus our cats Love the heat and always nap near-by. PS: Say “hi” to George as he sold us the insert. The most caring & professional company in the area. Dougie and Frankie are the best. Thank you! The crew as efficient & very professional. We were so impressed!!!! We are very very pleased with the service! 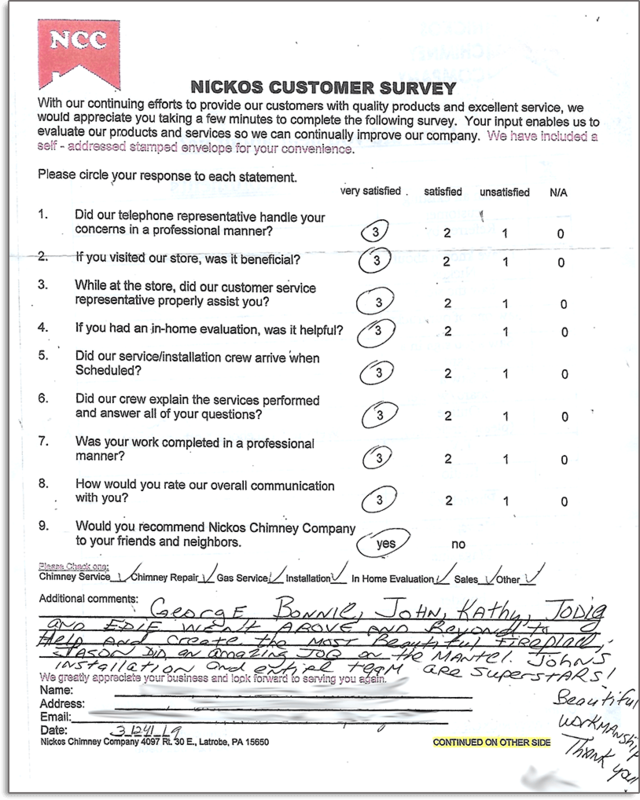 Jody was super nice from the start of our fireplace journey and George did a great evaluation and answered all our concerns. 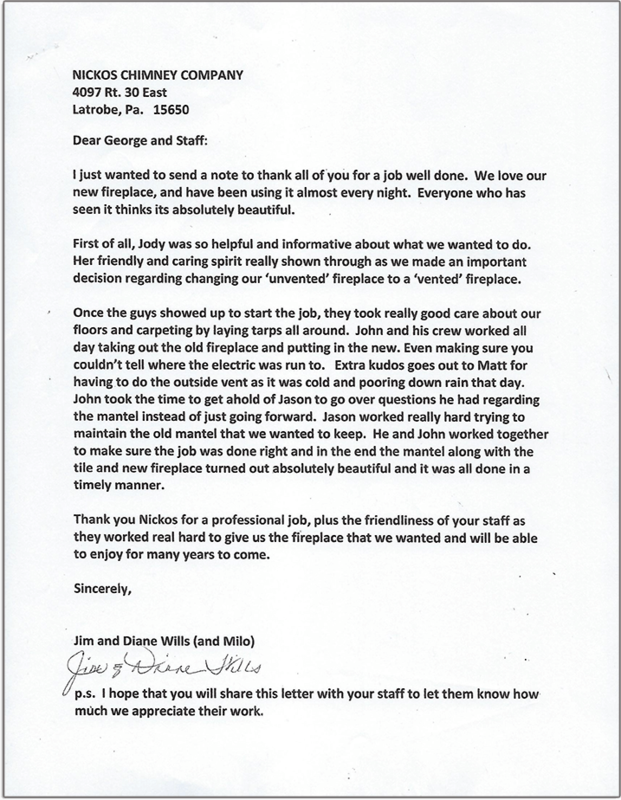 I believe it was John & Matt, but they were so so so professional with the installation of our nice fireplace and the cleaning was amazing. We are so very pleased and we thank everyone who helped us!!! Great job to you all. Thanks again! Excellent work from evaluation, estimating and completing the work, on time and very well done. I would gladly recommend your services to others. Thank you. Great job from start to finish. Everyone showed real pride in their work. Can’t thank you enough. Everything was good – no complaints. Always professional and friendly! Repair men very courteous and professional. Very nice fellows, job well done = GREAT. Very satisfied. Had chimney cleaned and a rain cap installed. Very pleased with the work and overall experience. The guys were very courteous and patient with their repair. Obviously know what they are doing. Very professional and like that he kept everything clean. Much appreciated! The guys did a fantastic job! Very professional, even made friends with our dog Remi. Thanks for working with us! Frank is excellent! It took a couple of visits and a couple of months – but he figured out the problem and we are all fixed. Technician was professional, neat, thorough, patient and knowledgeable. Our serviceman was polite and helpful. He replaced a part in our fireplace and made it look great. Very pleased with service. You had better hang on to this service man. He spent time explaining the problem. A very friendly, personable person. Doug & Frank were friendly, courteous, knowledgeable, efficient and very helpful. The job was completed in a timely manner. A through cleaning was performed. They are an asset to your company. The guys were very professional & took extreme caution in not getting dirt anywhere. I was impressed. Thanks! Service is always professional and friendly, going above and beyond! Your instore personnel are excellent! They are knowledgeable and friendly. Edie did a wonderful job in taking care of our problems. Thank you so much Edie! I was very impressed with the Nickos showroom. All personnel deemed very friendly. Staff at the Latrobe store were very helpful and knowledgeable. I needed to order chimney cap for a project at work. Your staff is very knowledgeable and made this process very easy. Thanks. Service crew man was the example of a well run caring company. Polite, knowledgeable, cleaned up after himself. Very well pleased. Highly recommend your company. The technician could not have been any better- highly efficient and helpful. The service men were very professional and knowledgeable. They gave us much information about our fireplace that we did not know. Doug was great. He did our initial installation. Appreciate your professional and personal attention to this project. Great job! Edie was very professional & Helpful. Doug was very nice and did a good job. Adam was awesome, polite, courteous and conscientious. Very thorough and a good trainer to his training partner, Excellent! Doug & Frank are professional & friendly. Answered all our questions, left everything spotless, Perfect! 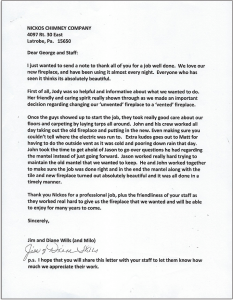 Your employees that you sent to do the work acted in a very professional manner and did a great job. Very satisfied with your organization. Will certainly continue to call you if we have further needs. Very satisfied. The representative who I spoke with on the phone was very helpful. The gentleman who did the repair was very thorough, efficient and polite also. Doug serviced our gas logs. He was very professional, answered all my questions and did an excellent job. Very pleased with his work! Great service always! Every intervention with Nickos has been very positive! Very satisfied with the repair to my gas log unit. We always call to Nickos Business because we believe that you are the best we have always had. Thank you for your great business. Thank you. Please say hello to George! Everyone at Nickos was very cordial, informative and helpful to all our needs. Thank you to Jody, Bonnie, Edie, George, Tom and everyone else. (chimney cleaners etc.) Who we may have missed, we are very pleased. We were please from the first visit to and thru installation. Final completed fireplace as good as I wished it to be. Just beautiful. Serviceman is a nice fellow and works neatly & quietly and he answer and explains those questions I have asked. Everyone we spoke to or dealt with was very friendly and helpful. Your service is what I expected. The inspection previous to installation allowed me to make sure prep was correct. Installers where very very good and fast. Repair of gas burning fireplace log set. Excellent service! Gary was the fellow-answered all questions, Very professional. All the staff was courteous, cordial and absolutely professional and efficient!!! Your service was 10+ ! Had a great experience with George for our evaluation and John (installer) was very professional! Team of workers arrived on time, were considerate of our home - completed work and left no evidence of being here – other than our beautiful new unit! 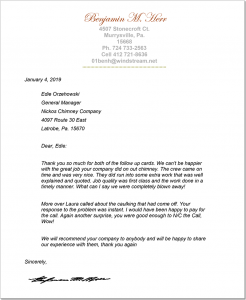 We are very pleased with your service and will continue to use Nickos! 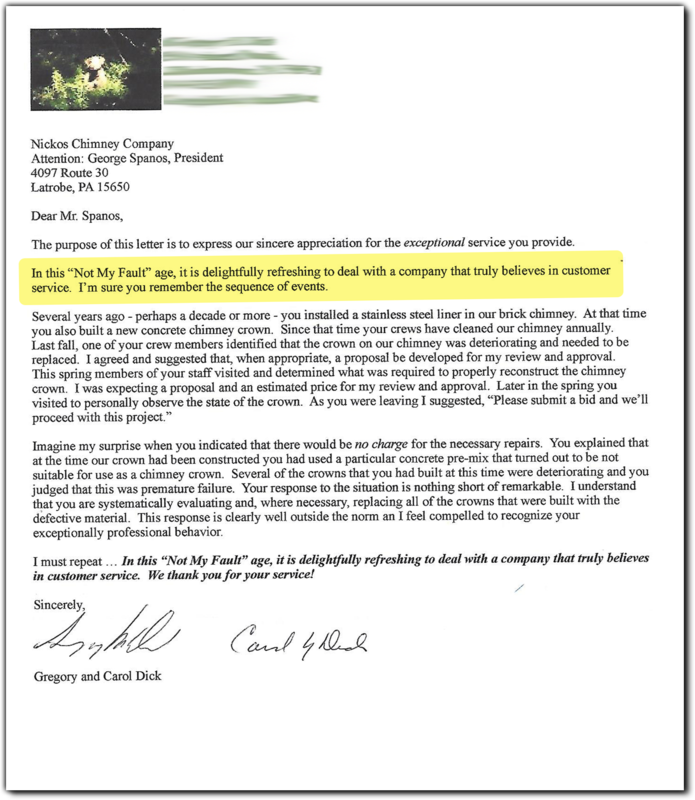 Everything relate to our purchase and installation of a fireplace insert and a ventless stove was handled with extreme curtesy and professionalism. 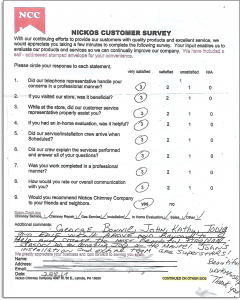 We are 100% satisfied and freely recommend Nickos to everyone- Thanks for a great experience! Purchased two fireplaces ten years ago, no problem. Very professional staff. Store is lovely. Adam & the other gentleman who cam to clean our chimney/wood burner were very friendly & professional. They were very knowledgeable & helpful in taking care of our issues. The office staff also very friendly & knowledgeable when we had to place an order for a wood burner part. Highly recommend Nickos – We had chimney cleaned, wood burner serviced and gas logs cleaned & service- crew were professional and highly qualified, very pleased. Doug explained working of the gas fireplace in a clear manner. Office girl and service guy were great. Great staff and the service crew that comes to my house for the annual inspection & cleaning are the best! I was very pleased that you were able to move my appointment up since I had an issue with fireplace not working. Doug is a nice guy. Ann was very helpful in customizing a spark screen for out outdoor fireplace. She worked with the fabricator to design an accurate fitting screen. Thanks! All workers were very helpful & Professional. Install crew was very clean and on time. Will definitely recommend and use you guys in the future. I had a new burner & logs installed. Worker was very professional & very, very neat. No dirt in my house. Thank you. The young man that cleaned our chimney was such a courteous, polite individual. Seemed to be a “people pleaser” and proud of the job. Great attitude! I recommend him highly!! Someone you would want to keep on as an employee. Gas fireplace – safety check and repairs, Technician wad excellent!! Always happy with our service from you! Appreciated your willingness to service our gas fireplace even though it was not purchased at your store. Very professional and nice people. Doug always does a great job. Had cleaning done, did great job & explained well on phone when scheduling – great job. The entire crew was extremely professional and courteous. Each step in rebuilding our chimney was detailed and explained. The crew leader did a fantastic job. We are very pleased. Service tech, Doug, was exceptional! We couldn’t be happier with our new MHP natural gas grill – made in the USA. I have not installed our new gas fireplace yet, but I am very happy with everything so far. Customer Service has been fantastic! Excellent in store and in home service. We have had three installations, one chimney repair. Very happy with my new gas grill and the new gas line. Love you guys and your products. I saw the store, stopped in and I was all “in” hook, line and sinker! Repair and service of fireplace All work done professionally. Thank you! The representative was very professional and did an excellent job. Everyone extremely nice – professional. Did a great job, thanks Doug. A no stress environment. Similar to walking to the neighbors to ask about his new mower, tool etc. Very great people to work with. Bonnie was very helpful showing us fireplace designs, logs and doors. Bill very knowledgeable with measurements and mantle is beautiful. John and Tom, great job with install, cleanup and instructions on how to use gas logs. We would recommend Nickos to everyone we talk to. Just look at the final product. Thank you. The workers were very knowledgeable and efficient. I will Gladly recommend Nickos. I’m also thrilled that your company cares enough to send out a satisfaction survey. Thank you. Keep up the good work! Installation of new gas fireplace. Love it! Gas log clean & repair. Doug is Awesome! We are a very satisfied customer who has been treated with respect, cares and concerns. Everyone was extremely nice and installers were so neat. I expected some dust, but they were so neat & clean. As a neat freak, I was so impressed!!! Great work. I was very impressed with my entire experience! The installers, John and Mike, were extremely good. Made no dust or dirt, professional, courteous and clean when coming into and out of the house. Would highly recommend!